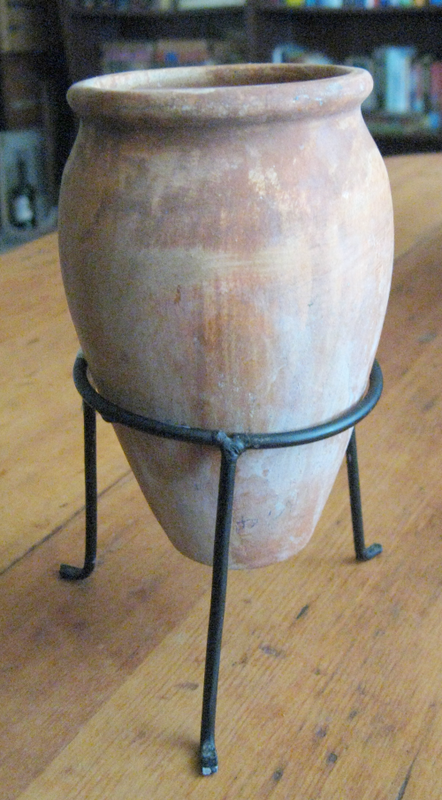 The zir or maybe zeer (Arabic الزير) is a huge ceramic jar used in Jordan for holding water. I was looking on the internet for an image of a zir and couldn’t find one. The closest I could find was this description of how to put two pots together with sand between them for either filtering or cooling. But that’s not it. Here is a miniature zeer from a tourist shop in Wadi Rhum that I was using as a pencil holder until the foot broke off. Except for the size, it looks pretty much like the real article. When I moved into my apartment in Jebel Weibdeh, there was one in the apartment that I cleaned up with bleach (paranoid much?) and used at first for cooling water, then later as a makeshift refrigerator. The ceramic pot is unglazed and quite porous. It is a bit pointy on the bottom and rests on a circular metal frame with three legs. 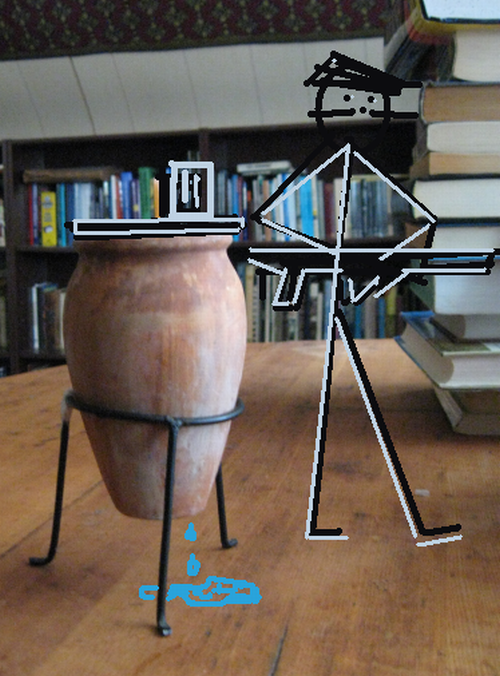 Water slowly escapes through the sides of the ceramic and evaporates, cooling the contents of the pot. Sometimes water drips slowly from the bottom and forms a small pool under the zir. I have come across a photo of Salt, the old provincial capital north of Amman, that shows two zeers by a watermelon stand and shows off an example of the city’s unique yellow architecture. The meme of Jordan “revoking Palestinians’ citizenship en masse” has been recycling since last summer. It resurfaced again last month, this time in a report from Human Rights Watch. A human rights group criticized Jordan on Monday for stripping the citizenship of nearly 3,000 Jordanians of Palestinian origin in recent years. Concerned about increasing numbers of Palestinians, who make up nearly half the population, Jordan began in 2004 revoking the citizenship from Palestinians who do not have Israeli permits to reside in the West Bank. Human Rights Watch said Jordan stripped about 2,700 Jordanians of Palestinian origin of their citizenship between 2004 and 2008, rendering them stateless. AMMAN, Jordan — A U.S.-based human rights group criticized Jordan Monday for stripping the citizenship of nearly 3,000 Jordanians of Palestinian origin in recent years. Nearly half the kingdom’s 6 million people are of Palestinian origin and Jordan fears that if Palestinians become the majority, it will disrupt the delicate demographic balance. Those concerns have been heightened by some Israeli hard-liners who argue that neighboring Jordan should become the Palestinian state and that more West Bank Palestinians should be pushed into Jordan. The Jordanian government on Tuesday said a Human Rights Watch report on the government’s treatment of Palestinian-Jordanians was full of “fallacies” and unsubstantiated allegations…. “The Interior Ministry does not have the legal authority to withdraw the nationality of any citizen,” [Minister of State for Media Affairs Nabil] Sharif added. …while others pointed out that the Queen herself is Palestinian, born in Kuwait. The first instance I can find of this meme is from the Israeli newspaper, Jerusalem Post, Jul 20, 2009, “Amman revoking Palestinians’ citizenship”. In this version, much echoed, the Palestinian population of Jordan has swelled from “less than half” to “70%”. So in the past three years 638 Palestinians have had their yellow cards replaced with green (losing full rights of Jordanian citizenship), while in the same period 12,325 Palestinians traded in green for yellow (granting them full rights as Jordanians). This is revoking Palestinians’ citizenship en masse? …1,000 East Jerusalem Arabs… residency permits have been revoked in the last year and a half. Separately, an Israeli human rights group said Wednesday that government statistics it had obtained showed a leap in the number of Palestinians who had their Jerusalem residency status revoked by the Israeli Interior Ministry in 2008. The group, HaMoked, said the 2008 figure of 4,577 residents of East Jerusalem whose residency was revoked equaled more than half the total recorded revocations in the previous 40 years since 1967. There is no country that has done more for the Palestinians than Jordan. During the 1948 and 1967 wars that forced so many Palestinians from their homes, only Jordan, Lebanon, and Syria accepted refugees. The refugees went to hastily constructed camps. 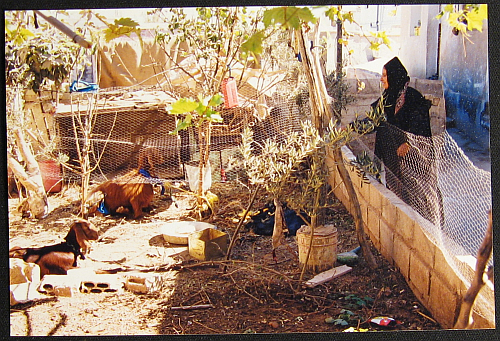 Today the Lebanon and Syria Palestinians and their descendants are still confined to those camps. They are not allowed to become citizens. Only Jordan has offered citizenship to the Palestinians who want it. Many do not, and prefer to live in Jordan and wait for repatriation (which most observers believe is unlikely–there are some 5 million Palestinians now in exile, out of the half a million who originally left), or more probably some kind of international reparations for their exile. Many Jordanian Palestinians do have Jordanian passports–I have seen them–and many more became financially successful enough to either leave the camps and buy property elsewhere (I have been a guest in the villas with Mercedes parked on the marble driveways) or improve the housing and living conditions they already have by rebuilding within the camps. I have seen the poor, with leaky corrugated metal roofs, and the well-off, with proper concrete housing, living side by side in the camps. Don’t get me wrong, the Palestinians are not always treated as full Jordanians; Jordan’s 1970 civil war and the assassination attempts against King Hussein are still remembered. The same argument was made when I was living there. Palestinians can go to Jordan, said the extremists. But Jordan doesn’t have the water to handle even more refugees forced out of their homes. 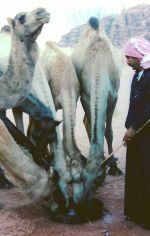 Even now Jordan’s sweet aquifers are turning saline from overpumping, as the adjacent saline aquifers leech into them. (You should have seen the layer of crud on the inside of my Jordanian teapot.) And isn’t there a huge aquifer that’s been discovered under the West Bank? Hmmm. transformation of the Jordanian East Bank into a Palestinian watan badil, or ‘alternative homeland’, so that the West Bank and the Gaza strip could be readily annexed to Israel. This watan badil theory-summed up by the slogan ‘Jordan is Palestine’ – had first been advanced in Israel in 1975; its leading exponent was Ariel Sharon, who was minister of agriculture, and then minister of defense, in two successive Likud cabinets. In the opinion of Sharon and his followers, the Hashemite order in Jordan was the chief obstacle to the annexation of Palestinian occupied territories by Israel. Since 1967, the Palestinians had actually come to form a substantial majority in the Jordanian East Bank. Thus, Sharon argued, Jordan would automatically become a Palestinian republic once the monarchy in Amman was overthrown. If necessary, the Israeli government could hasten the process by massive expulsions of West Bank Palestinians to the East Bank. The Israelis who are so anxious for a return to the days of Palestinian control of Jordan would do well to remember the days back before the 1967 war when the fedayeen from Syria and Lebanon operated openly from the Jordanian Wihdat and Husseini refugee camps, and the unguarded long border with Jordan was a sieve for those who would attack Israel nightly then escape back across the border into the safe haven of a nation that was sovereign, but as yet not strong enough to be able to prevent them. This is a Palestinian initiative to bear Palestinian responsibility, and that is a bold move on the part of the Palestinians, through a clear and detailed vision, to show that they are serious in taking on the task of building the state themselves, starting with Arab and international assistance and ending with self-reliance through state institutions. It is the project of proving the Palestinians’ ability to build and respect themselves and to inform everyone that something new has happened in Palestinian thought, vision and determination. 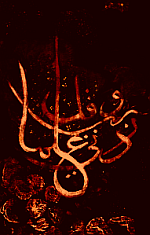 Traditionally, the Arabs in their private meetings have often discussed the Palestinians at great lengths in a language reflecting resentment towards Palestinian leaderships. Thus they would often level accusations of constant failure at the Palestinians and make them bear responsibility for the poor state of the Arabs. Today brings the opportunity for the Arabs to say that the Palestinians have become serious and can be supported and made to bear responsibility for success, not failure. Of course, what we speak of here is the political, financial and economic support necessary for building the institutions of the state of Palestine, support which must flow in an organized manner to the institutions of the Palestinian Authority. However, we also speak of repairing the relationship between the Arabs and the Palestinians, as well as of lifting the spirits of Palestinians on Palestinian soil. For example, Salam Fayyad’s plan of building an international airport in the West Bank, one in which Air Force One would land, carrying Barack Obama to the state of Palestine, is one of raising the spirits of Palestinians and of strengthening imposing Palestine as a de facto state. Thus it is necessary for Arab countries to extend their assistance and to lift the restrictions imposed on their citizens, so that they may visit Palestine as it builds its institutions, walk in the streets of Jerusalem, speak the Arabic language, stay at Palestinian hotels and eat at Palestinian restaurants. 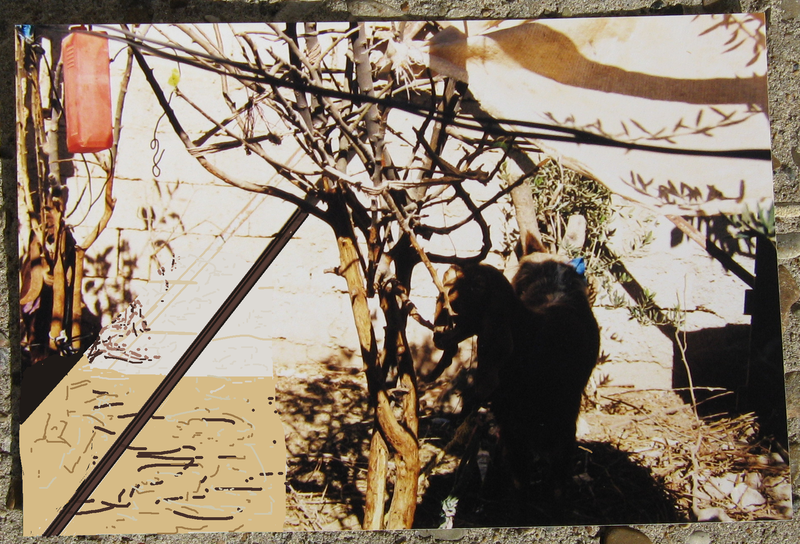 Such was the cry of Faisal Husseini: Come to Jerusalem to save it. Palestinian vision. I love it. A review of the plan by former ambassador Edward S. Walker is here, analysis by the Jerusalem Center for Public Affairs (JCPA) is here, an interview by Christian Science Monitor is here, and the full text of the plan is here. Palestinian independence. It’s a Nike thing. Just do it. Palestine should be printing their own frigging passports. Rana Husseini is tall, unusually tall for a Jordanian. Several years ago I met her when she was collecting signatures on a petition to do away with honor killing in Jordan. “If you are Jordanian, please sign the petition”, she asked the mixed Arab and western crowd. I got the point. I am a westerner and will never be able to understand this culture completely. Anything said by a westerner would be interpreted as unwelcome foreign meddling and would hinder the cause. Rana Husseini covered crime stories for the Jordan times. Every time I was in the capital I picked up a copy of the paper and looked for her byline. Over and over again she wrote the stories of women killed by their families. A thirteen year old boy saw his sister talking on the telephone, thought she was talking to a man, and strangled her with the phone cord. Another woman confessed to her brother that she was pregnant by an Egyptian who had left the country. The brother promised to get her an abortion and an operation to restore her virginity, then returned with a gun and shot her. 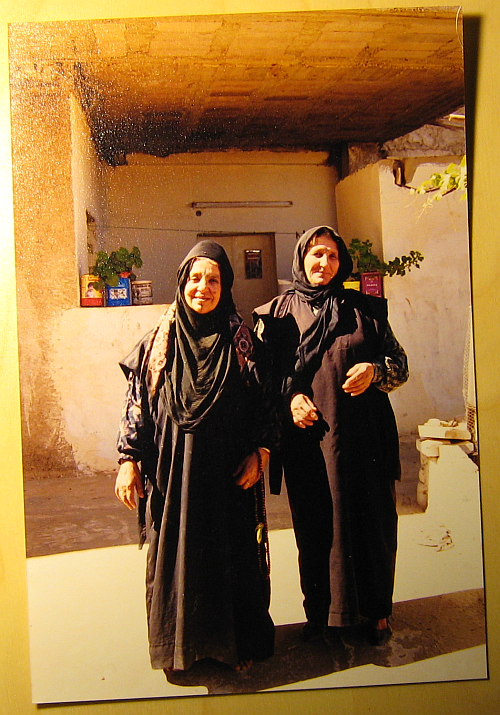 Sometimes Husseini would go to a village and no one would talk to her about the killing. Other times she received death threats herself. During the time I lived there about 30 women were killed by their families every year. The upper house of Jordan’s parliament, appointed by the King, had passed a bill against honor killings, but the bill could not pass the lower house, whose members are elected, largely through tribal politics. Since I left the law has changed. Honor killing is now illegal in Jordan. I want to emphasize two things. One is that all women are not threatened in this way in my country. Any woman who speaks to any man will not be killed. These crimes are isolated and limited, although they do cross class and education boundaries. The other thing is a lot of people assume incorrectly that these crimes are mandated by Islam, but they are not. 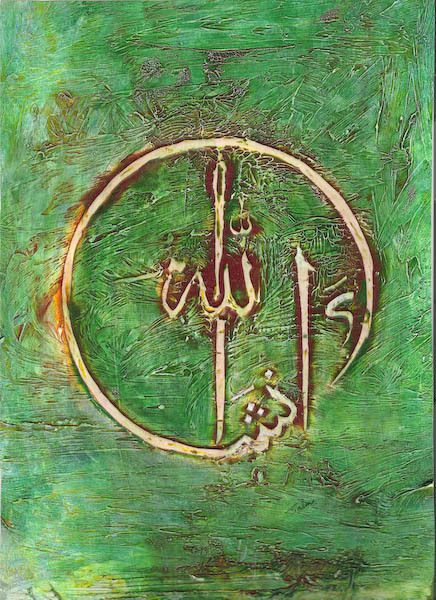 Islam is very strict about killing, and in the rare instances where killing is counseled, it is when adultery is committed within a married couple. In these cases, there must be four eyewitnesses and the punishment must be carried out by the community, not by the family members involved. Honor killings are part of a culture, not a religion, and occur in Arab communities in the United States and many countries. One-third of the reported homicides in Jordan are honor killings. The killers are treated with leniency, and families assign the task of honor killing to a minor, because under Jordanian juvenile law, minors who commit crimes are sentenced to a juvenile center where they can learn a profession and continue their education, and then, at eighteen, be released without a criminal record. The average term served for an honor killing is only seven and a half months. Rana Husseini has written a book on the subject, Murder in the Name of Honor. When it is released, it should be well worth reading. 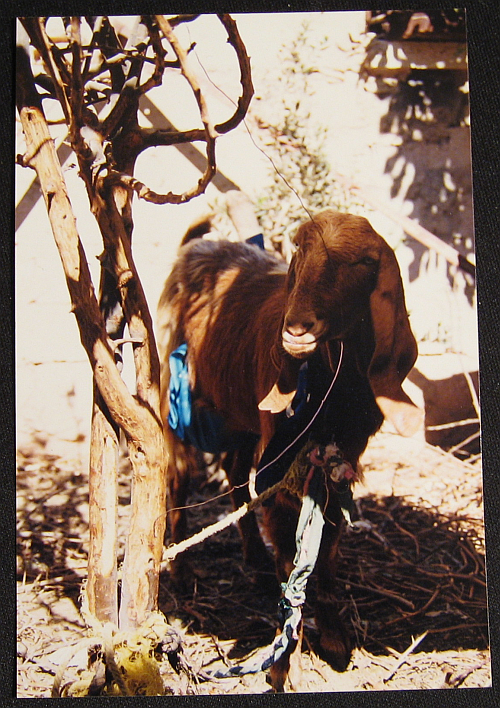 Here is a Jordanian goat. The goat belongs to Fatma. Fatima is the one on the left. Yes, they have tatoos on their faces. I found out later that Jordanian women don’t usually allow themselves to be photographed. I hope I don’t get into trouble with the Bene Sakr for this one. Fatima is stirring up the goats with a stick to try to get them to be more photogenic for the picture. Then Fatma took a picture of me with the goat. I don’t know if she ever used a camera before. I know a Jordanian guy who put a photo of his wife on the internet–she had a proper scarf on, hair completely covered and everything. He had to take it down after some guys at work started making nasty comments about her. There were pictures of his kids too, but that wasn’t a problem. I wanted to take a picture of her–I had stayed with the family a few times–but by then she didn’t want anyone taking her picture because of the bad experience. It’s too bad when women’s photos have to be removed–in any culture. You don’t see that happening with men. Jordan stops flirting with Hamas…for now. Last September I bookmarked a newspaper piece about Jordan courting Hamas and promptly forgot about it. The headline was “As a Palestinian state recedes, Jordan contacts Hamas“, the piece in the Lebanese Daily Star by Saad Hattar, but only the first paragraph is still available without a subscription to the archives. Jordan’s move to thaw relations with the Palestinian Islamic Resistance Movement (Hamas) following nine years of estrangement has raised eyebrows as to the timing and the motives behind this tactic. Internal and external factors dictated the rapprochement amid growing Jordanian dismay at American and Israeli behavior. Today there was a new headline, “Jordan and Hamas: a window briefly opened, then shut” and Hamas has once again become the orphan child in Jordan. This piece is by Rana Sabbagh-Gargour, who the Daily Star describes as “a journalist and former chief editor of The Jordan Times”. Since these things tend to disappear quickly, (yes, I know people use these pages for research) I have also archived it here. I remember the first time I met Rana Sabbagh, as she was called then, at the old Jordan Times building in Amman. It started with a chance meeting with a man named Abdul Rahman on a bus. Many people gave me their addresses or phone numbers when meeting me for the first time, and I usually filed them and ignored them, but for some reason, after a week or so I went and looked up Abdul Rahman at the small supermarket (a hole in the wall grocery store, actually) where he worked. It turned out he had been an editor in Kuwait during the 1991 Gulf War. The country of the paper he was working for at the time was at odds with Iraq, so he had spent some time in Iraqi prison and still had problems walking as a result of strokes he had after being beaten in prison. He knew I was a teacher, but he told me I should write, and introduced me to his friends as “a journalist”. “Write a newspaper article about this subject”, he said, mentioning something that had just happened that day. “Then take it to the Jordan times and ask for the editor”, he told me. I did. At the desk at the entry to the Jordan Times/al-Rai building, they were dubious, but they made a phone call and directed me to that area. Rana Sabbagh was in a meeting at the moment, but I was escorted to a small room where I explained my business and handed over the article I had written. A half hour later, she appeared. She was concise, brief, strictly business. She told me exactly why she couldn’t accept the article, and told me what to do about it. A week later I brought her another article which she bought. I cannot even begin to describe what it feels like to see your own byline for the first time. Thank you Abdul Rahman; thank you Rana Sabbagh. So back to Jordan and Hamas. If you really want to understand the complicated dance between Hamas and Jordan, read the whole thing. You will get everything you need to know about the situation without having to read anything else for background. But one thing really struck me. Jordan is allied with the Egypt/Saudi/PLA group and against terrorism of Hamas/ Hizbollah/Iran/ Syria. Jordan was itself the target of a spectacular assault on a wedding party by suicide bombers. What then could entice Jordan, which some have called America’s only Arab friend, to open talks with Hamas, a notorius group on the CIA’s terrorist list that Jordan has little reason to love? Jordan hates religious extremists. Jordan hates terrorists. There were the usual answers you would expect about yesterday’s elections in Israel, and wanting to give the new U.S. president time to format policy, but just like back in the days when Rana Sabbagh was editing the Jordan Times, when the most startling and provocative ideas were found after you turn the page five, column six, Rana Sabbagh has buried her most interesting observations in the ending paragraphs of her piece. Jordan’s sudden courtship of Hamas was triggered by the fear of a new massive influx of refugees, this time from Palestine. [Mohammad] Dhahabi’s [former head of Jordan’s General Intelligence Department (GID), who was removed on December 29] calculation also reflected growing mistrust within the Jordanian establishment of Fatah, the dominant faction in the PLO, which Abbas heads. Dhahabi was worried that Fatah elites might negotiate a peace deal at the expense of Jordanian interests to save their faltering legitimacy. Having Hamas and the Jordanian Islamists on the side of official Jordan would curb the agenda of influential politicians in the US and Israel who continue to see Jordan as an “alternative homeland” for Palestinians. Jordan’s sudden affection for Hamas, then was a result of powerful American interest groups (Jewish and Christian, although Sabbagh is too polite to say so) who do not accept the two state solution. 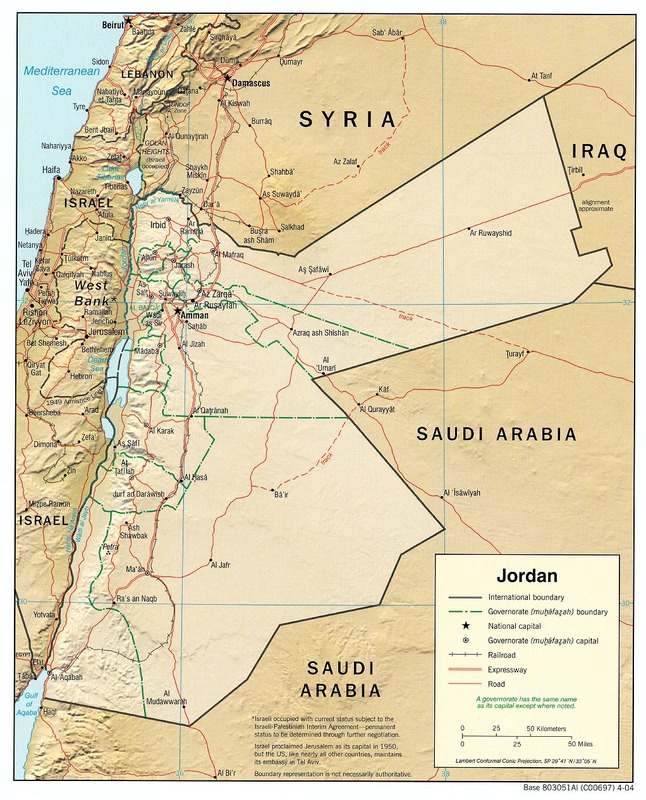 Jordan has now changed direction, but for how long? Sixty per cent of Jordanians are Palestinian. Jordan has welcomed wave after wave of refugees–Armenians, Circassians, Palestinians (after both the 1948 war and the 1967 war), and then the Iraqis. The Palestinian refugees, led by Fateh, started a civil war against Jordan in 1969, because after being pushed out of the West Bank, they wanted to use Jordan to continue their war on Israel. Several assassination attempts against King Hussein failed. How much more chaos can Jordan absorb? If Jordan’s Kings weren’t possibly the smartest heads of state in the world, America and Israel might long ago have lost their staunchest ally in the Arab world to religious extremists. For now, the rapprochement with Hamas is (officially, at least) dead. But I suspect it wouldn’t take much to bring it back. “We will continue to push for a two-state solution to protect Jordan’s security and stability while making sure that Palestinians in the West Bank are empowered with security and economic stability to stay on the ground and to bury the ‘Jordan is Palestine’ scenario,” a Jordanian official has said. This is a joke right? Americans would never tell a sovereign nation they had to accept a massive resettlement of people from another country so they could be forced out because they were the wrong ethnic group? Wrong. Since the latest action in Gaza, the late night threads of PumaPAC have teemed with exactly that kind of sentiment. I thought it would disappear after the inauguration, but it has continued. In fact just yesterday it appeared here. If Jordan does ever embrace terrorism it won’t be because they want to but because they were pushed to by American extremists like this.